GYM74 Series is an Outdoor Pedestal Bottle Filler. The unit has a barrier-free arm drinking fountain. Bottle filler shall be activated by a 9 volt sensor or a pushbutton as standard. Unit shall contain a 100 mesh inlet strainer, lead and cyst filter, 6-AA battery pack and laminar flow spout. 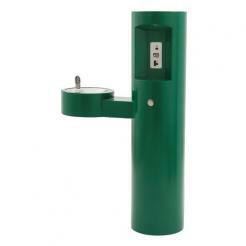 Pedestal bottle filler with drinking fountain shall be Murdock model GYM74. Construction shall be 12 gage, all stainless steel with 18 gage stainless steel fountain bowl. Pedestal base shall have four mounting holes. Access covers shall be secured with vandal-resistant stainless steel screws. Bottle filler shall be activated by a 9 volt sensor or a pushbutton as standard. Unit shall contain a 100 mess inlet strainer, lead and cyst filter, 6-AA battery pack and laminar flow spout. Self-closing pushbutton, needing less than 5 pounds force, shall activate internally mounted valve with adjustable stream regulator. 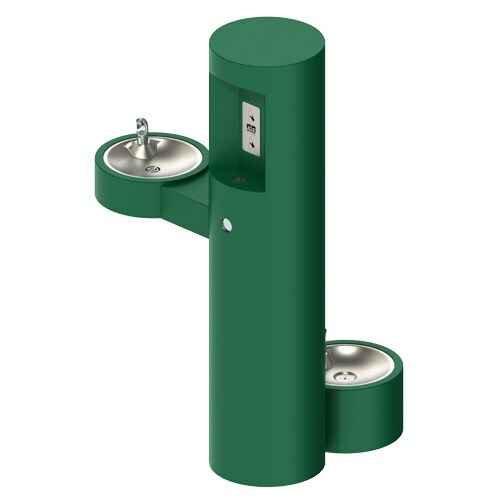 Bubbler shall be stainless steel with non-squirt feature and operate on water pressure range of 20-105 psig. Fountain is certified to ANSI A117.1, Public Law 111-380 (NO-LEAD), CHSC 116875 and NSF/ANSI 61, Section 9. Fixutre meets ADA requirements when mountain appropriatey.